He was born on February 24, 1955 in San Francisco, California, US. Steve Jobs married Laurene Powell on March 18, 1991. He has two songs and a daughter. Steve Jobs co-founded Apple with Steve Wozniak and Mike Markkula. Steve Jobs is the Chairman of Apple Inc. He earlier served as as CEO of Apple, to which he resigned on August 24, 2011. Jobs takes only $1 a year as salary and holds 5.426 million Apple shares and 138 million shares in Disney. Steve Jobs's wealth is the 43rd wealthiest American with an estimated wealth of $5.1 billion in 2009. He previously served as chief executive of Pixar Animation Studios. Steve was adopted by Paul and Clara Jobs. Although Steve’s biological mom wanted her son to be adopted by college graduates and Paul and Clara were not. They promised Steve would go to college when he grew up. Steve dropped out of college after one semester to save his parent’s money. He did drop-in though for 18 months. Steve’s original aspiration was to become a Buddhist Monk. After traveling to India with one of his best friends from Reed College. Upon his return with shaved head, he became a Buddhist. He worked with Steve Wozniak for Atari game systems before Apple Computers. They reportedly were paid $5,000 for their work of which he shared $375 with Wozniak. We all probably know that Steve Jobs began Apple Computers, Inc., in 1976 with Steve Wozniak in his parents’ garage. But there was a third member, Ronald Wayne. After two weeks Ronald left for a one time payment of $800 for his share of Apple stock. Reportedly this stock would be worth $22 billion today. Jobs and Wozniak named the company Apple because they were huge Beatles fans. He had four children, one out of wedlock that he at first denounced, but later claimed and went on to have a great relationship with and even named a computer after her. Steve was actually a pescetarian not a vegan. Jobs stock in Disney had more value than in Apple, since Steve sold a lot of shares in the 90’s and owned less than 1% at the time of his death. 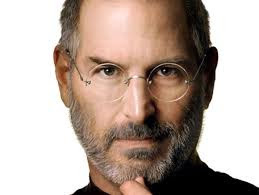 Steve had over 300 patents. Jobs bought Pixar for 5 million and transformed it with their first movie Toy Story. Jobs was credited as an executive producer on the film Toy Story. He dated John Baez when he was younger. It is rumored that the name of the new iPhone4s means iPhone 4 Steve. He was upset that Wozniak was employee number 1 and that he was employee number 2. He protested until he became employee number 0. He was obsessed with type fonts and calligraphy. Claims that the reason why Apple had different fonts was probably because he dropped into a calligraphy class in college. He saw his first computer at age 12. He owned over 100 pairs of Levi jeans. Steve Jobs is credited as the executive producer of 1995 movie Toy Story. Steve was diagnosed with pancreatic cancer in 2004. In April 2009, he underwent a liver transplant at Methodist University Hospital Transplant Institute in Memphis, Tennessee. Steve Jobs was awarded the National Medal of Technology from President Ronald Reagan in 1984. He was named the most powerful business person by Fortune Magazine on November 27, 2007.
that a co-worker has told you in passing about your skills. Be confident, but do not be arrogant.